Just when you thought your company was getting a handle on phishing and malware attacks via regular email and media, powerful new mobile devices and web 2.0 apps are providing new attack vectors for cybercriminals. Social engineering via social networks and mobile devices is an emerging frontline for IT security. Putting appropriate security policies and controls in place to mitigate these threats will give your organization an edge over less diligent competitors. 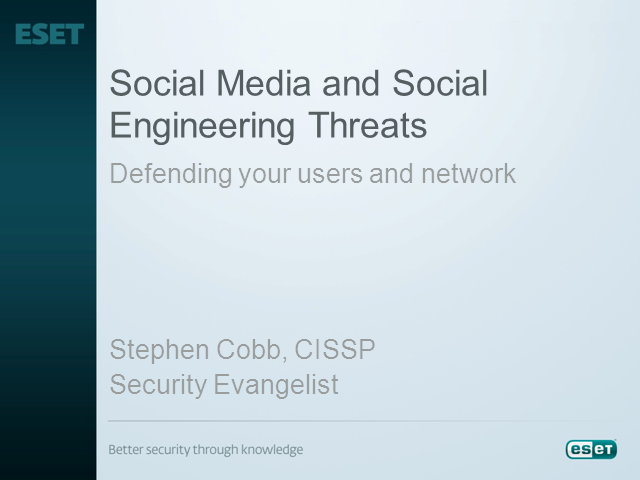 Join Stephen Cobb, Security Evangelist at ESET for a walkthrough of the characteristics that make social networks and mobile devices dangerous and what you and your organization can do to gain control of your network.